How Does a Walk-In Cooler Work? Though most people relate to matters of refrigeration by thinking of how their home refrigerator works, a walk-in cooler actually operates in a very different way. Instead of using cold air generated by a connected freezer unit, a walk-in cooler actively generates cold air as needed to maintain the temperature set at the thermostat. The cold air is created using fans and a condenser much like what a window air conditioning unit would use, with the condenser unit cycling on and off to maintain the temperature. The thermostat of the walk-in cooler determines the air temperature within it; when the temperature rises above the level of the thermostat, the condenser unit turns on to start a new cooling cycle. The unit's fans pull air into the unit and over the condenser's coils. The coolant within the coils pulls the heat from the air as it passes over. The cooled air then continues to move out the back of the unit, cooler than it was when it first entered. As the fans continue to blow air over the condenser, the air temperature within the walk-in cooler will lower until it is once again below the level set by the thermostat. The coolant within the condenser coils will be continually pumped during the cooling cycle; this ensures that the coolant doesn't heat up too much before being given a chance to cool down again. 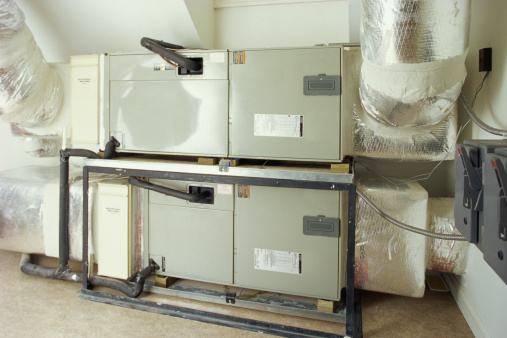 A second cycle exists in order to prevent the condenser from freezing up and becoming covered in frost and ice. If the thermostat falls too low (generally 35 degrees Fahrenheit), the fans will start again without the coolant cycling. This serves to gradually warm the condenser coils because the coolant isn't being cycled and cooled. The defrosting cycle will continue until the temperature rises to within an acceptable range again. One key component to an efficient walk-in cooler is its insulation. A standard walk-in cooler will have between 2 and 4 inches of Styrofoam insulation within its walls and a rubber sealing gasket around its door to help ensure that it is both airtight and well-insulated against the temperature of the air outside. This insulation and sealing keep outside temperatures from affecting the air within the walk-in cooler, ensuring the condenser only has to cool the air directly inside the unit.